Archeologists disappointed to learn the discovery isn't thousands of years old. 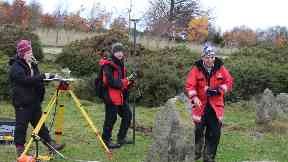 A stone circle thought to be thousands of years old has been revealed as a replica - built in the 1990s. Archeologists were initially excited about the addition of another Recumbent Stone Circle to the many already identified in Aberdeenshire. But during further investigation into the site in the parish of Leochel-Cushnie, it transpired it is a replica around 20 years old. The site was reported by the current owner of the farm where it was found. Some unusual features were noted during its recording, including its small diameter, proportionately small stones and lack of an obvious associated cairn or kerb stones. There is, however, a huge amount of variation between Recumbent Stone Circles so these differences were not initially a major cause for concern. It was therefore celebrated as being an authentic Recumbent Stone Circle by Adam Welfare of Historic Environment Scotland and Aberdeenshire Council's Archaeology Service. 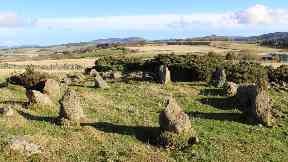 Research into the site was cut short when a former owner of the farm contacted Mr Welfare to say they had built the stone circle in the mid-1990s. Neil Ackerman, Historic Environment record assistant at Aberdeenshire Council, said: "It is obviously disappointing to learn of this development, but it also adds an interesting element to its story. "I hope the stones continue to be used and enjoyed - while not ancient it is still in a fantastic location and makes for a great feature in the landscape. "These types of monument are notoriously difficult to date. For this reason we include any modern replicas of ancient monuments in our records in case they are later misidentified. "We always welcome reports of any new, modern reconstructions of ancient monuments, especially those built with the skill of this stone circle and that reference existing monument types." Recumbent Stone Circles were constructed around 3500 to 4500 years ago and are unique to the north-east of Scotland.